This was a hike/climb of Arizona's state high point, Humphreys Peak. The elevation of this peak is 12,633 ft and the trail is nearly 10 miles in total distance. 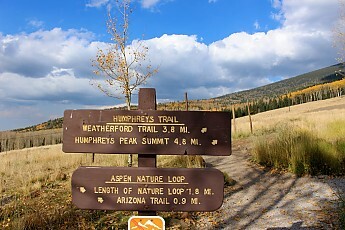 The peak is located within the Coconino National Forest, Kachina Peaks Wilderness Area. It is part of the San Francisco Peaks which were what remained after a huge stratovolcano blew its top. The volcano was estimated to be 18,000 ft in elevation. I also hiked into the Inner Basin on another day and it was amazing as well. As was the custom 40 years ago, I carved an aspen tree up in the San Francisco Peaks with a heart and the initials of the girl I was chasing at the time. My Dad had a ranch on the Coconino NF south of Flagstaff. It is a great part of the world. The elk herd eventually put us out of business. Nice pictures, Rob. I'd like to get there some day. How long did the hike take? Total time was 6 and a half hours that's counting taking pics and lounging on the summit. About 3 hrs to hike to the summit one way. I highly recommend this hike to any highpointer. Over the many years I have lived in and around Flagstaff I have hiked the peaks many times.